The Civil War was trying, bloody and hard-fought combat for both sides. What was it, then, that sustained soldiers low on supplies and morale? For the Army of Tennessee, it was religion. 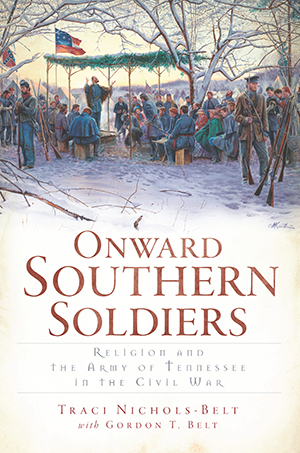 Onward Southern Soldiers: Religion and the Army of Tennessee in the Civil War explores the significant impact of religion on every rank, from generals to chaplains to common soldiers. It took faith to endure overwhelming adversity. Religion united troops, informing both why and how they fought and providing the rationale for enduring great hardship for the Confederate cause. Using primary source material such as diaries, letters, journals and sermons of the Army of Tennessee, Traci Nichols-Belt, along with Gordon T. Belt, presents the history of the vital role of the army's religious practices. Traci Nichols-Belt is an ordained and licensed minister and holds a master's degree in history from Middle Tennessee State University and a bachelor's degree in political science from Anderson University. During her academic career at MTSU, Traci worked for the Tennessee State Museum and wrote two National Register nominations for the Johnsonville Historic District in New Johnsonville, Tennessee, and the Historical AME Church and Cemeteries in Alexandria, Tennessee. Traci has also worked as a historical consultant and grant writer for the Clement Railroad Hotel and Museum in Dickson, Tennessee. Traci's article “Chaplains in the Army of Tennessee, CSA: Warring Disciples Carrying the Gospel” was published in the Winter 2004 issue of the Tennessee Historical Quarterly. Additionally, she wrote a review of Sam Davis Elliot's book, Doctor Quintard Chaplain CSA and Second Bishop of Tennessee, for the Spring 2004 issue of the Tennessee Historical Quarterly. Gordon T. Belt is an information professional specializing in local archives, historical research and government and public policy. He currently works as the library manager for the First Amendment Center at Vanderbilt University in Nashville, Tennessee, and has written several articles for the First Amendment Center website on legislative issues and history. Gordon holds a master's degree in history from Middle Tennessee State University and a bachelor's degree in political science from the University of Tennessee at Chattanooga. He is an active member in the Society of Tennessee Archivists and holds memberships in the Society of American Archivists, Special Libraries Association, National Council on Public History and the Tennessee Historical Society. Gordon is also the founding editor and publisher of The Posterity Project, an award-winning blog devoted to issues related to archives, history, civic responsibility and open access to public records in his home state of Tennessee.